This profit and loss (P&L) statement template summarizes a company’s income and expenses for a period of time to arrive at its net earnings for the period. The monthly P&L template is perfect for businesses that require regular reporting and detail. 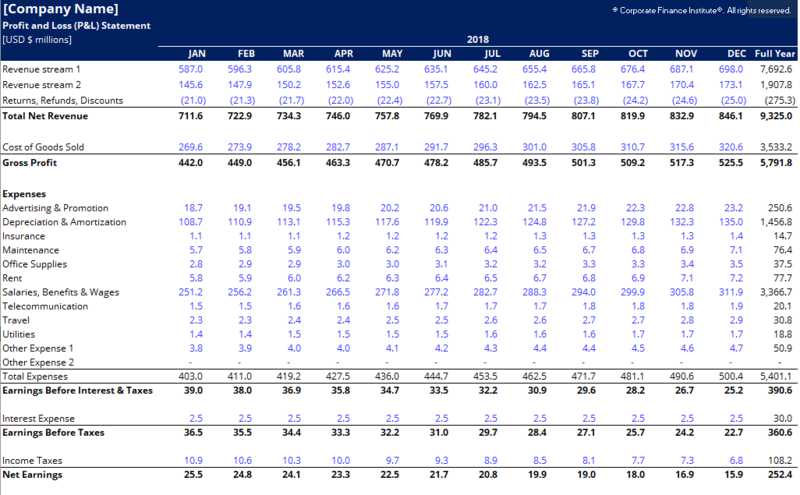 By showing all of the information in a series of monthly columns, much more detail is visible than if only the annual figures were shown. The monthly profit and loss template is perfect for small, medium and large businesses as it can easily be adjusted to add or eliminate detail as required. For businesses that have been in operation for several years, it may be helpful to show an annual (full year or year to date) statement. The annual profit and loss template below follows the same format and structure as the monthly version, however, it doesn’t have a total column at the end that sums up each of the periods. This template is ideal for any size business and can easily be changed by adding or removing line items (rows) as necessary.